The moment she walked onto the stage in the amphitheatre, the huge audience jumped to its feet with a standing ovation. 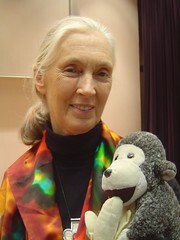 I wondered if there is anyone in the world who does not know of Jane Goodall. I wondered what it would be like to that well known. Jane spoke of the incredible support of her mother – throughout her life, but especially in childhood. I chuckled especially hard when she told how her mother didn’t freak out when she found Jane in bed at the age of 1 1/2 with earthworms. She simply explained that earthworms can’t sleep in beds, that they would die without the earth beneath them, and she helped her young daughter to move the worms back outside. Jane also spoke of the books she read as a child. One of those books was Tarzan. She was entranced by the idea of living with the animals and learning to “speak” to them and understand them. And then she said, “Imagine how I felt when he went off and married that other Jane.” The whole audience burst into laughter! (1) Kids are teaching their parents about environmental issues. Keep teaching the kids and encouraging them to take the message home. (2) With age comes wisdom and conviction. Jane, now in her mid-70s, says it is her conviction that gives her the energy to keep the lecture schedule she keeps (315 talks every year). (3) Every person makes a difference with his or her choices. (Note: not can make a difference. Does make a difference.) Every item you purchase, every food you eat, every behavior you choose has an effect. We would do well to think as the indigenous people did about how a decision will affect the next seven generations. Anyway… listen to Jane. She says it all much better than I. Lucky you to have seen her talk! Great post – Important Message #3 is soooo true. I have always admired her work. I agree with Adam…#3 is important enough to be posted on every fridge and desktop in the western world. It’s interesting you should mention whether there is anyone in the world who doesn’t know of Jane Goodall. Last year in Julie Zickefoose’s blog, she had a post about receiving a postcard from Jane Goodall congratulating her on the publication of her “Letters from Eden” book. I got goosebumps just reading Julie’s post and thought how cool it would be to receive a personal message from someone as famous as Jane Goodall. Then I took an informal poll of approximately 8 people from work, home, and family. Of those 8 people, 4 did not know who Jane Goodall was. I was somewhat shocked at these results, but realized it’s probably in where your interests lie. The sad thing is that if I asked those same people who Dale Earnhardt was, they all would probably know! Ha ha… I had to google “Dale Earnhardt” to figure out who he was… That’s funny. I’m going to try to check that out this weekend,-sounds like a great lecture!